Blurb- The year is 2019. The world, as we know today, is not the same anymore. Blatant threats of war by ‘world leaders’ is the new normal. Gone are the days when mobilizing armies at borders, or aiming missiles at adversaries, was a rare phenomenon. With every nation or their allies possessing nuclear weapons, victory through conventional means is no longer possible, paving way for covert warfare to emerge as the preferred weapon. 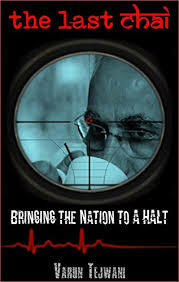 New Delhi is an easy target and Doshi, the unassailable supremo of the regime, is on the ‘hit list’. The threat assessment being at an all time high, Ajay Kaamte, the director of SPG (Special Protection Group), is tasked with protecting the PM. Intelligence claims that the PM is susceptible to cyanide attacks and situation is grim, to say the least. Will Doshiji survive to serve another term or will he very soon be having his last chai? Review- The Last Chai is thriller fiction written by Mr. Varun where author serves us intriguing plot with amazing storytelling skills. This book is one of the brilliant thriller i have read by an Indian Author. Book Title and Cover- Book Title is interesting and creates curiosity about it. Cover is alluring and appropriate. Blurb is interesting and attracts readers to pick up the book. Overall, First Impression of this book demands attention of readers. Language and Narration- Language used by Mr. Varun is simple yet attractive. Narrating style is commendable and author ends each chapter at such point that readers are forced to turn page after page. Theme- Theme of this book is strictly thriller. Although it also serves us Suspense, Crime, and other elements. I liked the way author directly came to the main point without wasting time in unnecessary descriptions. Characterization- Mr. Varun skillfully writes about his characters and readers can feel the emotion of characters and story through his words. Each character is justified properly. Storyline and Plot- Plot is unique with detailed description of each and every situation which glue readers with the story. As said earlier, story picks the pace from the first page and readers enjoy every page filled with mystery, suspense and excitement to reveal the truth. Overall, The Last Chai is thriller fiction which is perfect blend of Mystery, Suspense and amazing story telling skills which i am sure will entertain readers. I would recommend this book to readers who read Thriller Fiction.